This sculpture is by the Canadian figurative sculptor, Blake. 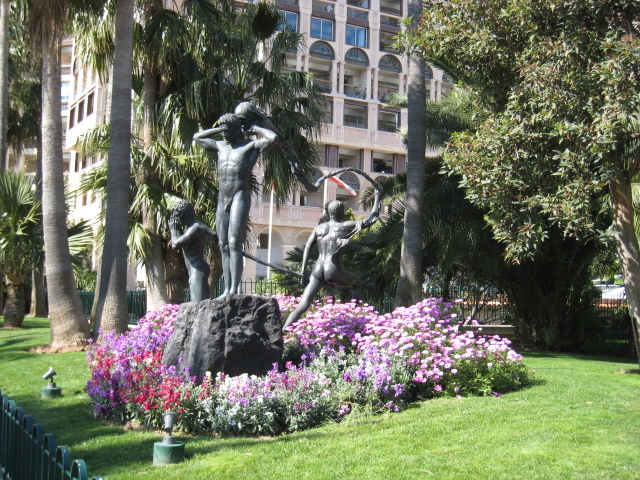 It's installed in gardens by the Heliport of Monaco in Fontvieille. Les Atlantes is dedicated to the celebration of life. Depicted are three men representing various aspects of physical, emotional and spiritual existence. In the background of the photograph above, you see part of the luxury apartment building called Seaside Plaza, where incidentally, Princess Stephanie of Monaco has an apartment. Lucky Princess Stephanie ;-) Need I say more? 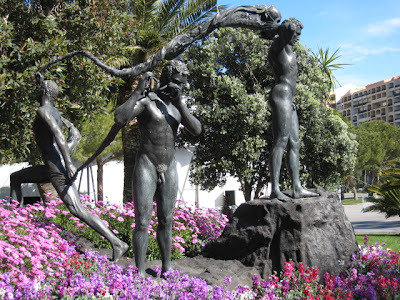 I like those flowers but the sculptures aren't to my taste somehow..
Everything always looks so lovely in Monaco!